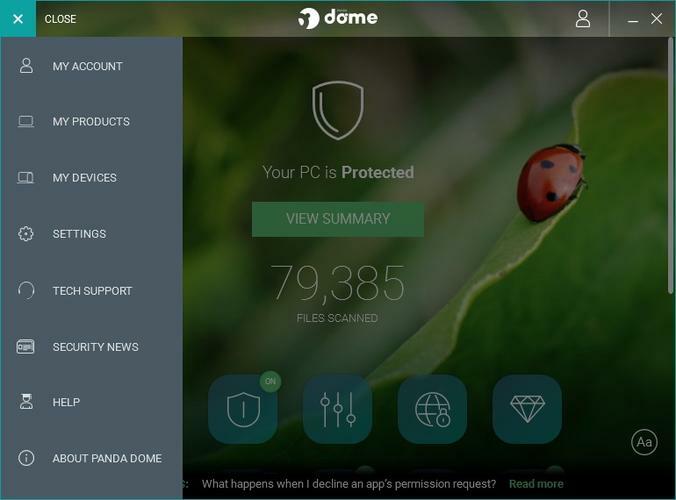 Panda Dome Premium is a very expensive security suite with a ton of features with mixed protection results. If you know about Panda Security you probably think of it as one of the top choices for free antivirus. Behind its famous freebie, however, are several paid suites that add extra features and support. The lineup was recently renamed Panda Dome, with the top suite called Panda Dome Premium, which costs $155 per year for a single PC—new customers pay $116.24. Instead of the yearly payment, Panda also offers a subscription option where you pay a monthly fee. Going the subscription route ups the costs even more, of course, with a yearly price of $155.88 to cover just one PC. Holy. Moly. Whichever route you choose, Panda Dome Premium is one of the more expensive suites we’ve looked at. 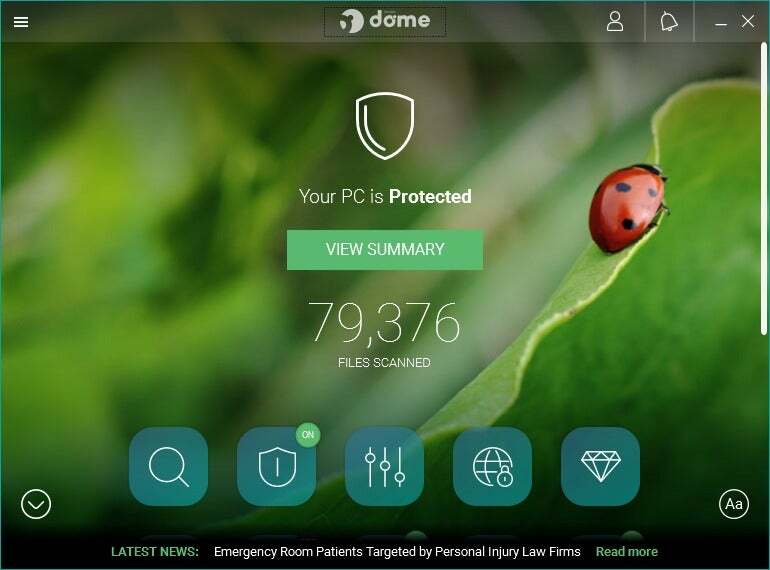 It costs $263 ($197.24 is the special offer price) to cover 10 devices with Panda Dome Premium, for example, while Norton Security Premium will cover the same amount of devices for $110. The upside is you get an absolute ton of features for those prices, although that’s not without its problems. Earlier versions of Panda, such as Panda Gold Protection, tried to cram a ton of features into a tiled interface with multiple pages. Panda Dome Premium’s default view. In Panda Dome Premium, all of the main features are listed in a single scrolling list with each one shaped like an iOS app icon. If the feature is active there’s an “ON” badge in the upper-right corner of each icon. With its Dome protection, Panda is looking to unify the interfaces across mobile and PC, which is why Dome Premium looks like it was lifted straight off an iPad. I’m often critical of mobile-style design for the PC, but in this case it works. The program window is the right size, the icons can show text if you need it, the badges are informative, scrolling down the list is easy, and the hamburger menu icon in the upper left is already as common on PCs as it is on mobile. Panda Dome Premium’s scan options. The first icon in the dashboard is Scan. 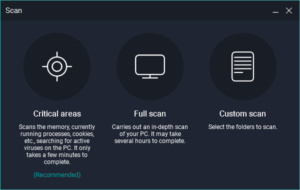 Click that and a smaller window opens up with three options: Critical areas, Full Scan, and Custom scan. 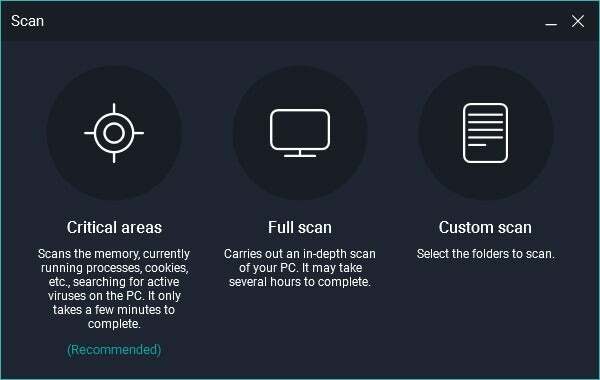 The last two options are self-explanatory, while Critical areas scans memory, running processes, browser cookies, and other data for malware. It’s nice, easy, and straightforward. Going back to the primary interface, the Antivirus icon is where you can see information about your latest scan, quarantined files, and scheduled scans. Next up is PC Cleanup, which oddly gets a place of priority in Panda Dome. This is a common “extra” that top-level security suites have, with tools like a disk defragmenter, hard drive cleaner, and a startup apps manager. All of these features are either built-in to Windows 10 or you can get them for free with a third-party utility, but if you want them all in one spot, Panda provides that. Panda Dome Premium includes a VPN with its premium protection that offers unlimited bandwidth and 21 different country locations and is powered by Hotspot Shield. A premium antivirus suite with a premium price deserves premium service, and Panda Gold delivers that with live, 24/7 tech support. Panda Dome’s Wi-Fi Protection feature. Panda Dome comes with a ransomware monitor called Data Shield that is not enabled by default. There’s not much to this. Turn it on, follow the wizard to specify the folders that should be protected, and away you go. Another notable feature is Wi-Fi Protection. As we’ve seen with many smart home monitoring features from the likes of Eset and Bullguard, Panda’s Wi-Fi Protection lets you see what’s going on with your network. It isn’t quite as user friendly as the other services since it just lists devices by IP address and manufacturer instead of device name. It may get a little more user friendly over time as the smart home trend grows. 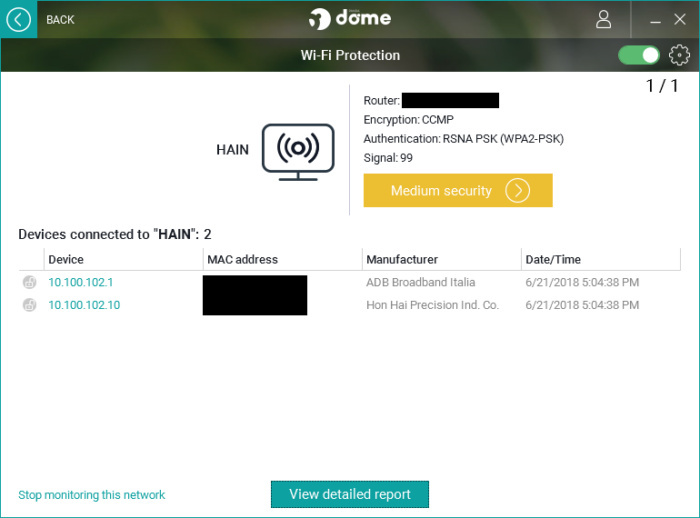 Panda Dome can assess your router’s security. 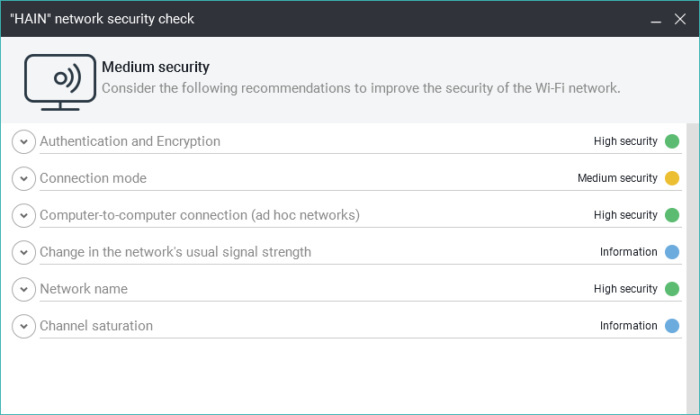 The most interesting feature of Wi-Fi Protection is its near immediate auditing of the security level for your router. 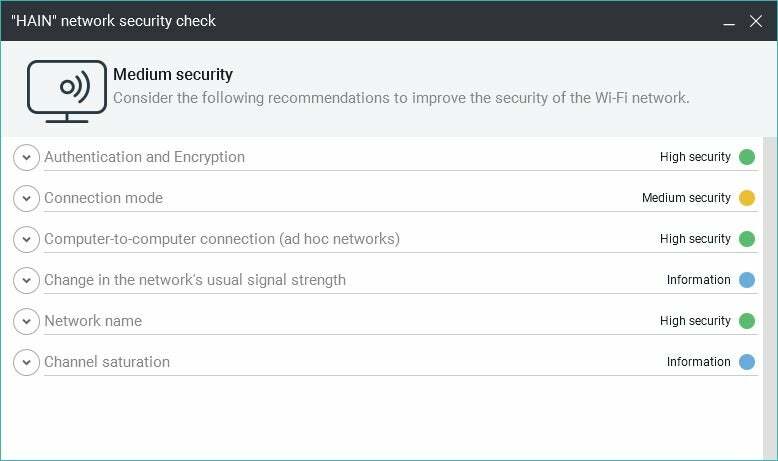 My home router popped up as “medium security,” for example, with a helpful checklist about what was going on. Panda liked my level of authentication and encryption, network name, and ad hoc network security. It recommended that I change the “connection mode” to something more secure since mine was automatic. It then directed me to click a link to get more information. When I clicked on the link, however, Panda directed me to a help page with no relevant information for taking a deeper dive. It seems to me that most people will end up with a medium security rating, because of their router’s connection mode. Panda’s help page for Wi-Fi Protection even shows a router with the same results as mine. It would’ve been helpful if Panda just said something like that right in the report card such as, “This router has medium level security. This is quite common and probably nothing to worry about, but if you are concerned click here to learn more.” Then provide some actionable information behind the “learn more” link. 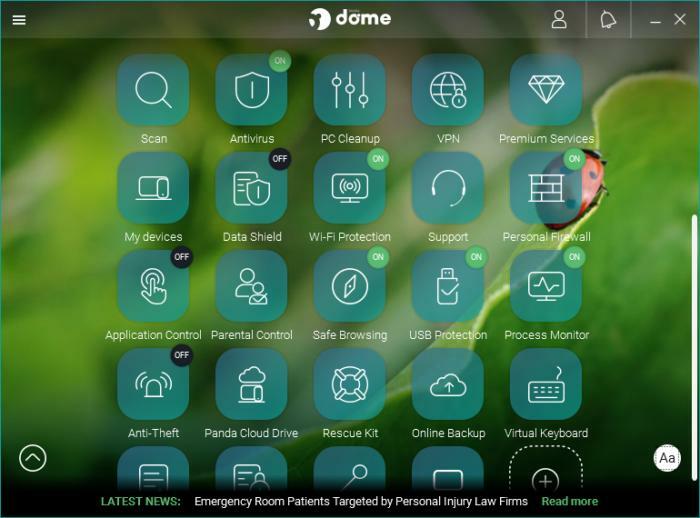 There are so many features in Panda Dome Premium that we simply can’t cover them all here. Another nice one is called Process Monitor. This is a look at what’s running on your PC right now. At the top you can see how many processes are being executed, how many need the internet, and if there are any processes that might be a threat. Under that is a list of the most recent processes discovered, with an option to view a report to get all the information you could ever want about running processes. The expanded list shows which processes are digitally signed, whether they’re safe, and how many HTTP connections they have. It’s all very easy to read and understand, and it’s also a great way to get lost in PC nerdom for a little while. 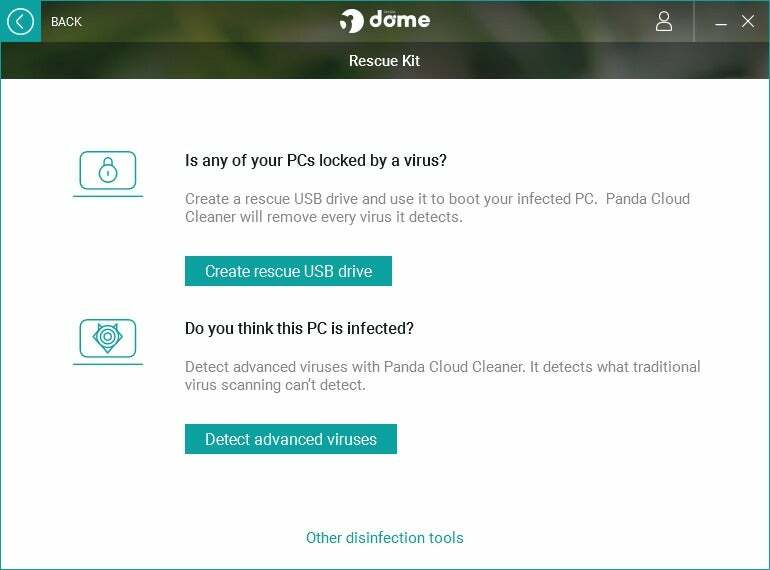 Panda Dome Premium also has a USB drive scanning feature that we’ve seen in other security suites. By default this feature will ask if you want to scan a thumb drive or external hard drive. There are several other features including an application control feature to restrict which programs can be executed on your PC, a device location feature called Anti-Theft, parental control, and a built-in Cloud Drive that lets you sync files just as you would with Dropbox and OneDrive. There’s also a file shredder for extra secure deletion, online backup, and AceBit’s Password Depot password manager. The latter could be helpful if you don't already have a password manager, but the version in Panda Dome is not as user friendly as it could be. Two final features that are particularly standout are Rescue Kit and the Virtual Keyboard. Rescue Kit is for dealing with advanced virus problems. It lets you create a recovery drive to boot your PC and then disinfect the PC. This should be done ahead of time or on a non-infected PC. If that’s not an option then there’s the advanced virus detector that uses Panda Cloud Cleaner—a virus scanning app that can run on the desktop or off a USB stick—to take a deeper dive into your PC hardware. Virtual Keyboard is exactly what it sounds like: a software keyboard you operate with your mouse. It is supposed to prevent any potential keyloggers installed on your system from siphoning credit card details or sensitive logins while you type them in. If that's not enough, each icon has its own settings where you can tweak various options for all of Panda Dome’s features. One last notable addition to Panda Dome over previous Panda suites is that at the bottom of the primary window is a Latest news ticker where you can terrify yourself by keeping up to date on all the latest hacks and PC security issues. At this writing, only AV-Comparatives had looked at Panda in recent months. The testing organization looked at Panda Free, but typically the more expensive suites use the same or similar detection engines. In AV-Comparatives’ real-world protection test for July 2018 the suite blocked 100 percent of the 186 samples, with eight false positives. In the malware protection test for March 2018, Panda blocked 99.99 percent of more than 20,000 samples with 0.01 percent compromises and more than 300 false positives. Panda Dome offers a ton of features. For our in-house tests, Panda showed a small bump in the PCMark 8 Work Conventional test. The test rig scored 2,448 before Panda was installed, and 2,554 after installation and a full disk scan. Higher is better and that’s a small but noticeable bump, which as we’ve said many times before is the norm right now. As for the Handbrake test, there was no change, with the test PC re-encoding a 3.8GB MKV HD video file to the Android preset in one hour and 15minutes both before and after Panda’s installation. 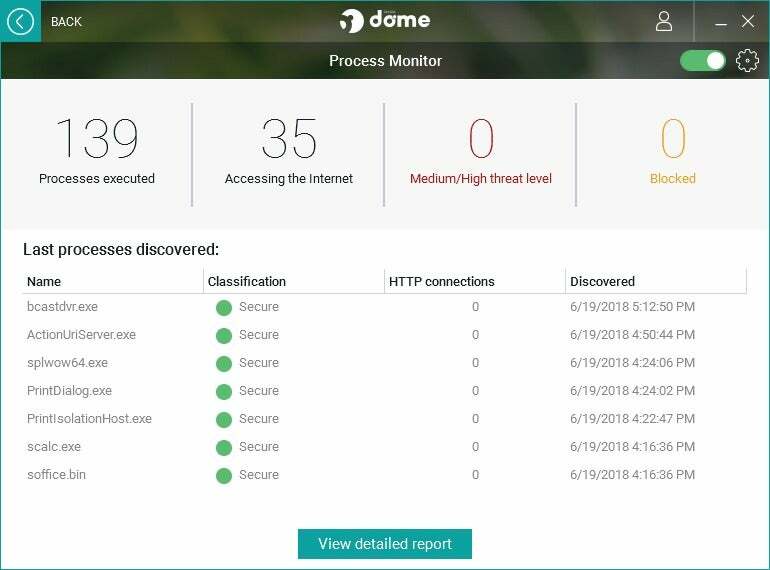 Panda Dome Premium offers a ton of features in addition to the usual malware protection and real-time scanning. Those extra features are almost too much for the average user even in this simplified user interface. If you’re a power user, however, all those bells and whistles will likely appeal. Based on our tests, your performance should be okay. Panda’s results in the most recent malware tests were mixed, but historically Panda scores highly in tests from both AV-Test and AV-Comparatives. The only sticking point with Panda is that it’s expensive. You do get a lot for that price, but you can definitely get antivirus protection that’s just as highly rated at a better price.